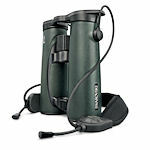 Swarovski EL Swarovision Pro binoculars improve over the previous EL models with upgrades to the neck strap and objective cover connections! They retain the fluoride HD glass and upgraded lens and prism coatings for improved brightness, sharpness, and contrast. 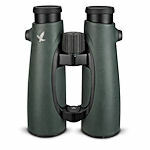 The EL Swarovision Pro binoculars have the same longer eye relief, wider field of view, 4.9 foot close focus on the 42mm models, and field flattener lenses that have made the original Swarovision binoculars so popular. The EL Swarovision binoculars also fit more faces as the minimum interpupillary distance has been reduced to 56mm.